Super Cheap Boats: $2,500 or Less? Yes! A simple plug caused hours of grief - today's outboard engine problems are often more like computer problems than engine issues. Today’s outboard motor is a completely different beast than those of yesteryear. And it’s no wonder – remember the days when you could fix a car with a set of wrenches, a screw driver, and pliers? Today, if you don’t have a computer you may as well forget about all that other stuff. 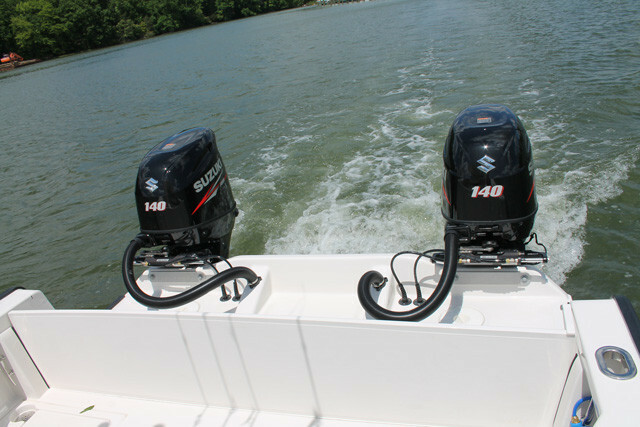 Unfortunately, outboards are the same way. And in the past couple of years I’ve encountered some new types of engine issues that have shut down the boat. The most unusual occurred on a brand-spanking-new boat. A friend of mine took delivery, and the boat seemed to run like a top for several hours at a time. Then, one outboard would suddenly decelerate to 3500 rpm. If he shut the system down and re-started it, the boat would run fine again. For a while – then the same thing would happen. Over 50 hours of diagnostic time with a marine mechanic proved fruitless. The decision was made to isolate each engine by installing independent wiring harness, controls, and gauges. The mechanic went to pull the plug on the harness… and discovered it had been only partially plugged in. He pushed, the plug clicked, and from that moment forward the engine ran flawlessly. A simple plug caused hours of grief – today’s outboard engine problems are often more like computer problems than engine issues. In another case, while the engines on a new boat seemed to run okay, the digital gauges wouldn’t work. One moment they showed 4000 rpm, the next they showed zero. Speed ranged from 30 mph to 300. Then we realized that the problem went away when we turned off the (integrated via NMEA 2000) chartplotter. Due to a software glitch, that plotter was “confusing” the electronic gauge panel. Another funny situation popped up when an outboard on a boat I was testing started surging from the moment it was started. The rep assured me the boat had run just fine the day before, and couldn’t figure out what was going on until he discovered that the ECU’s brains were completely scrambled. Then it dawned on us that there had been a number of severe thunderstorms the night before; the boat had been hit by lightning, and its electronic know-how went right out the window. Here’s the bad news: most problems of this kind will be un-fixable without the help of a pro. But the next time your late model outboard doesn’t run right, as you troubleshoot it, remember: the problem is just as likely a computer glitch or an electrical snafu as it is a mechanical issue. And in that case, a laptop can do more for you than a wrench, screwdriver, or pliers.